Reprint. Originally published: London: Newnes, 1939. 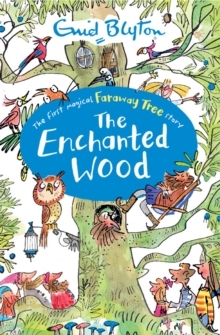 The Enchanted Wood is the first magical story in the Faraway Tree series by the world's best-loved children's author, Enid Blyton. Come on a journey full of magic and adventure in THE MAGIC FARAWAY TREE!When Joe, Beth and Frannie move to a new home, an Enchanted Wood is on their doorstep. And when they discover the Faraway Tree, that is the beginning of many magical adventures! Join them and their friends Moonface, Saucepan Man and Silky the fairy as they discover which new land is at the top of the Faraway Tree. Will it be the Land of Birthdays, the Land of Toys, or even the Land of Ice and Snow with its magic snowman? Look out for the other titles in The Magic Faraway Tree series: The Magic Faraway Tree, Folk of the Faraway Tree, and Up the Faraway Tree. Also available in beautiful deluxe editions. Look out, as well, for the Blyton Colour Reads series. Chock full of vibrant colour illustrations from Alex Paterson, these are the perfect way to introduce The Magic Faraway Tree adventures to children aged five and up. Enid Blyton is arguably the most famous children's author of all time, thanks to series such as The Wishing-Chair, The Faraway Tree-, The Mysteries, The Famous Five and The Secret Seven. Enid takes her place alongside Roald Dahl, Beatrix Potter, and A. A. Milne as one of Britain's true heritage children's authors. 'Her books were terrific page-turners in the way no others were' - Michael Morpurgo, author of War Horse.